ARMONK, NY and WASHINGTON, DC--(Marketwire - September 26, 2007) - IBM (NYSE: IBM) and the Smithsonian Institution today announced the virtual opening of the National Museum of African American History and Culture, the Smithsonian's 19th and newest museum. This online presence marks the first time a major museum has opened its doors on the Web prior to the construction of its building. While the physical museum will be built on the National Mall in Washington in 2015, it is opening online now to serve as a place of collaboration among scholars and the general public. "The Smithsonian is honored to work with IBM to create this virtual platform for the National Museum of African American History and Culture," said Lonnie G. Bunch, founding director of the museum. "This initiative allows us to share the rich culture, to preserve the important history and to make the African American past available to millions globally. Because of this partnership we can build a new community of supporters and enrich the educational resources of children in America and around the world." A key Web site feature is The Memory Book which allows site visitors to upload their memories in the form of a story, an image or an audio recording. An online map, which can be navigated, shows how these diverse memories are linked to each other and to content created by the museum to spotlight people, places, issues and moments in African American history. These memories will become part of the museum's first oral history collection and give site visitors an opportunity to participate in the museum's development. Because the site, built using social networking technologies known as Web. 2.0, allows visitors to contribute content, it becomes a vibrant community of users who can help both define the African American experience, as well as promote an understanding of what it means to be an American. "We're pleased to provide our expertise and leading-edge technologies to enable this museum to come to life," said Samuel J. Palmisano, Chairman and Chief Executive Officer of IBM and a member of NMAAHC's Advisory Council. "IBM's partnership with the National Museum of African American History and Culture will help create a new type of facility -- one that is not only being built for visitors, but being created by visitors. Technology is allowing people to be this important museum's first curators." -- Dr. William Anderson, an osteopathic surgeon and leader of the Civil Rights Movement in Georgia, uses a book excerpt to tell of his work with Dr. Martin Luther King, Jr. and Rev. Ralph Abernathy. -- Jackson B remembers rolling Easter eggs at the National Zoo in Washington in the 1930s. -- Kelvin B. Fowler tells how his great-great grandfather escaped slavery by hitching a boat ride with a group of fisherman and sailing to freedom in Virginia. The navigational map is created by the people who submit content and create their own "tags" or keywords, meaning people posting their stories can help create links to other events or stories. As museum-goers search through historical events or memories, the navigational map will redraw itself to focus on related associations. This is a powerful tool that helps participants visually understand the interconnectedness of events and people in history. Museum staff will review entries prior to external posting to assure the appropriateness of content. 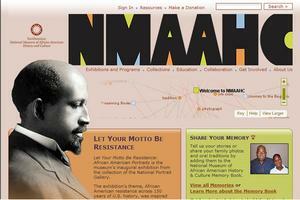 The NMAAHC is the first museum website to partake fully of the Web 2.0 social computing revolution. The site is based on cutting-edge, open source programming frameworks such as Ruby on Rails for collaborative website development. It employs concepts such as tags, or keywords, created by the users to help organize the content. As a result, the Museum on the Web is an example of the bottoms-up web, meaning it's both a product of a site visitor's participation, and an enabler of creating a community for them. The site runs on IBM System X web and database servers. -- "Save Our African American Treasures," a program to foster understanding about discovery and preservation of African American material history. The national collections initiative features workshops designed to help people identify and preserve objects of historical and cultural significance such as photographs, diaries, legal documents and household items. -- "Let Your Motto Be Resistance: African American Portraits," the museum's inaugural exhibition, organized in collaboration with the Smithsonian's National Portrait Gallery and the International Center of Photography in New York. This collection of 100 photographs traces 150 years of American history through the lives of well-known abolitionists, athletes, artists, scientists and scholars and shows how they used their work to put up "resistance" to negative attitudes about race and class. The exhibition will be on view at the National Portrait Gallery in Washington from October 19, 2007 to March 2, 2008. -- The African American Legacy Recordings, a series of compact disc recordings showcasing the work of a variety of artists and scholars including W.E.B. DuBois, singer-activist Paul Robeson; poets Nikki Giovanni and Sterling Brown; and actors Ossie Davis and Ruby Dee. The National Museum of African American History and Culture was created by an Act of Congress in 2003. Its collections and educational programming will cover topics as varied as slavery, post-Civil War Reconstruction, the Harlem Renaissance, and the Civil Rights movement. In addition to staging a national tour of its inaugural exhibition, the museum is scheduling programming in five target cities: Atlanta, Chicago, Los Angeles, New York and Washington, D.C.